“The assumption that the major urban areas of the state do not maintain enough density for a mass transportation system can no longer be considered valid. It has been shown conclusively that mass transportation is a shaper of urban form. In other words, the density will develop naturally once the system has been installed.”–from What Mass Transportation Means to Texas, Report of the House Committee on State Affairs, 63rd Legislature, 1975. Arlington, Texas is home to the Texas Rangers, Dallas Cowboys and the International Bowling Campus. It is the site of Six Flags Over Texas, as well as the headquarters for American Mensa. Arlington started as a stop on the Texas and Pacific railroad. For the first part of the twentieth century, the city was connected with the metroplex by electric rail. By the early 1950s, auto dealer Mayor Tommy Joe Vandergriff recruited General Motors to build a factory. The city annexed in all directions, and the population exploded. 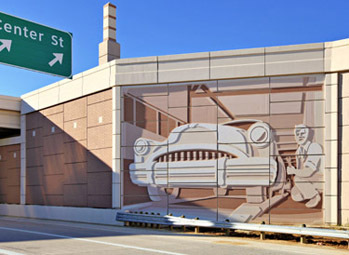 The traffic on I-30 affords drivers plenty of time to view this mural celebrating car culture on the side of the highway. 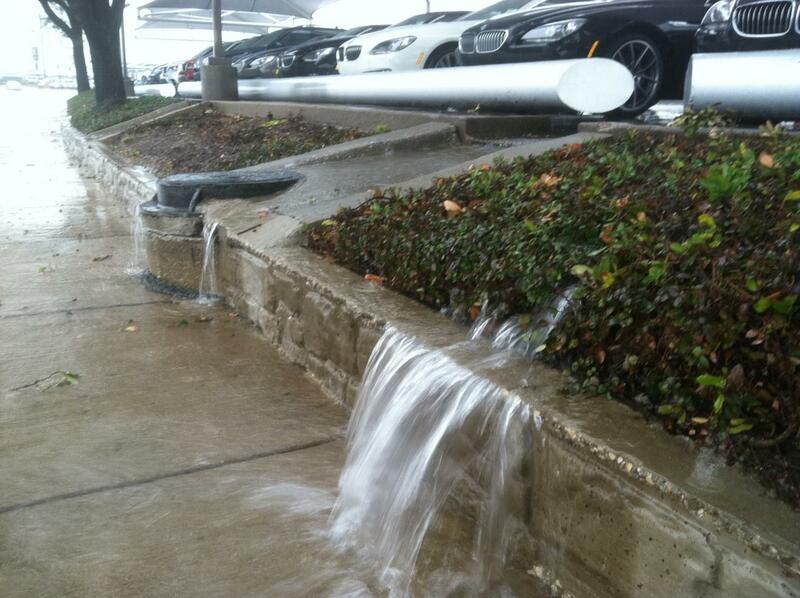 Now Arlington is an inhumane place. Ninety-nine square miles filled with roads and parking lots, sidewalks leading to nowhere, right turning cars that will run you over in the crosswalk while you have the walk signal, and no public transit system. 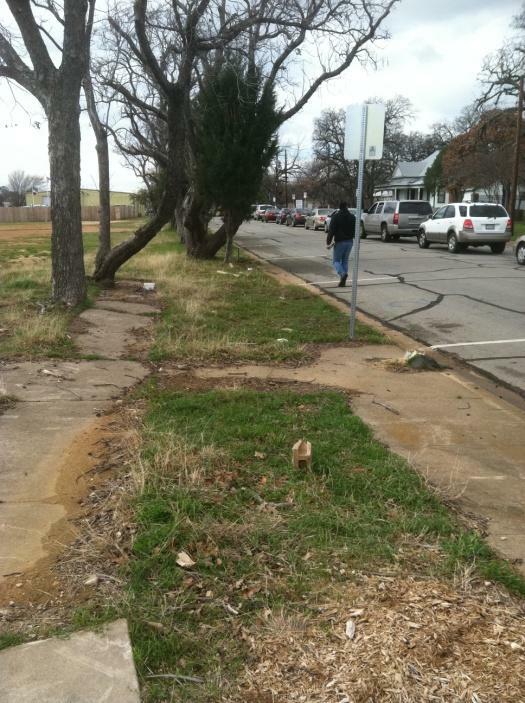 Much of the city is inaccessible to those with disabilities and it is inhospitable to bikers, walkers, and poor people. If you find yourself without a car in Arlington, be prepared to rent one. If you don’t have insurance or don’t drive, you’ll need to cough up the money for a taxicab. I’ve done both…but I’d prefer to walk, ride my bicycle, or take a bus. 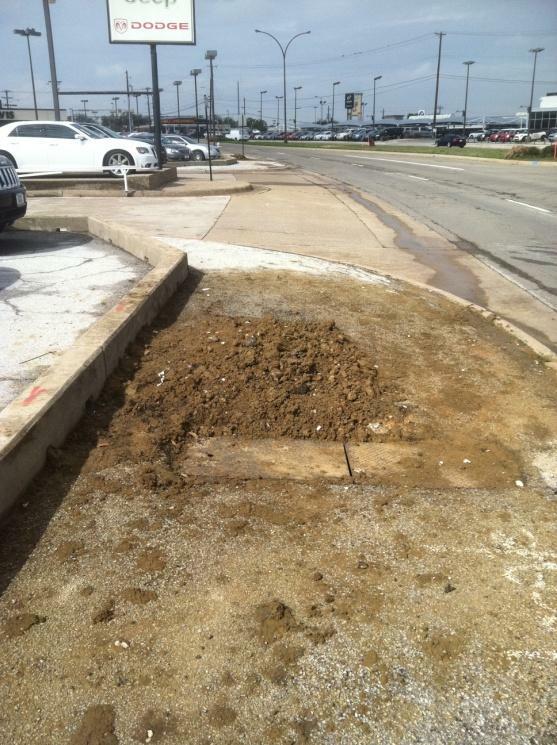 The “sidewalk” bordering one of many Arlington car dealerships. In tourist season, you can catch a tourist trolley to sports complexes, Six Flags, and the like–but only if you stay in a participating hotel. The trolley bus is run by the Arlington Entertainment District, a public-private “partnership” that was the beneficiary of $270 million in Federal DOT money for road improvements, landscaping, and overpasses around I-30. This might seem odd, but Arlington is known as a city that uses tax dollars and public space to bolster private interests. An article in the San Francisco Weekly explains how Arlington shifts tax dollars normally devoted to public transit toward public subsidy of sports stadiums. The Rangers ballpark is paid for, but residents will pay for the new billion dollar Cowboys Stadium for the foreseeable future. The University of Texas at Arlington, whose administration aspires to propel it into a Research I university, has more than 10% international students. Many of those students, as well as other students at UTA, are without transit. First year Nursing student Anithia Meme recently started an online petition and presented it to the City Council. 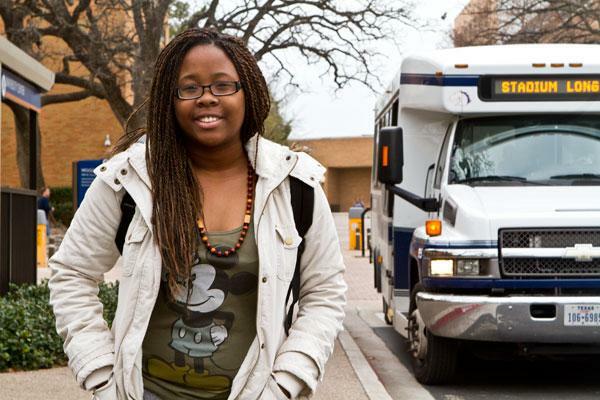 UT Arlington student Anithia Meme is petitioning for public transit. Photo from The Shorthorn. Arlington voters have repeatedly voted down public transportation as well as bicycle lanes in the past. The public discourse centers around the cost (Dallas Area Rapid Transit member cities contribute 1 cent of local sales tax) but also on the fear of attracting “undesirables” (coded language aimed at poor people of color). No member of the City Council currently champions public transportation, even as the petition continues to garner support from students as well as faculty and staff on the UTA campus. Elsewhere, large public universities anchor robust public transit systems, even in sparsely populated areas. The University of Massachusetts/Five Colleges system and Pioneer Valley Transit Authority comes to mind. These systems operate on a combination of federal dollars, local taxes, and student fees; students ride for “free” (it’s paid from a portion of their fees) and the buses are open to the public for a fee. For now, UT Arlington only operates an occasional weekend shuttle that allows transit-dependent students an opportunity to go grocery shopping and to the mall. Handitran, Arlington’s only public transportation service, provides transportation for elderly and disabled citizens to essential services such as medical appointments and to work. The service is commendable, even if their mandate is narrow. BMWs are more important than you. Tarrant County transit operates some stadium shuttles to football games. Trinity Railway Express, a diesel commuter line between Dallas and Fort Worth, has a station about two miles north of Arlington. Commuters going to Ft. Worth can park near I-20 and ride a bus. Lastly, Mission Arlington, an Arlington Christian charity, offers “emergency assistance” transportation to get people t0 social services and employment. But instead of a cobbled together barely-functioning system of the tourist trolley, park and ride to Fort Worth or the stadium, and the Handitran, Arlington should be moving toward regionally integrated public transit, connecting with the TRE, DART and Fort Worth/Tarrant County transit. All residents and visitors to the Dallas-Fort Worth Metroplex would benefit from “seamless” public transit. The alternative is to continue walking on the broken sidewalks, fighting traffic, and perpetuating costly low-density car-dependent sprawl. In this case, the petition is just the first step. Without a sustained campaign, elected officials and city planners will continue to ignore the grassroots efforts. Success will require a strategy that builds a broad-based coalition including students, bicyclists, environmentalists, labor unions, and working class residents of Arlington. Such a campaign would be an opportunity to fight for a more environmentally friendly city, expose institutional racism, broaden accessibility, and create living wage construction and transportation jobs. Socialists should support this effort in Arlington, as well as all the other “car cities” spread across the country. Robert is a graduate student at the University of Texas at Arlington. All photos taken by the author, unless noted otherwise.